These textural socks were inspired by the beauty of wrought iron rails. The interaction of twisted stitches, cables and lace creates a sculptural yet surprisingly stretchy fabric. These socks are worked from the cuff down. The pattern includes written instructions and charted stitch patterns. Options are provided for short and long leg lengths and for three foot lengths. This pattern was designed for the Barking Dog Yarns Group as its July/August 2013 KAL but is now available to everyone. 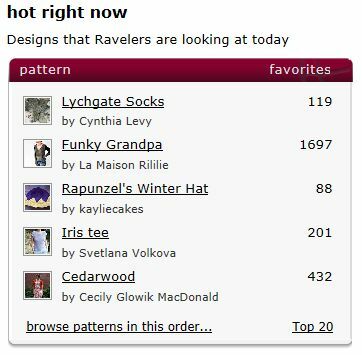 This pattern made it to the very top of the "Hot Right Now" list on Ravelry during its launch!